Firstly, when the various fields of interior design (for example, office, home, retail and hotels) cross-fertilise, the offspring can produce questionable results. Office designers, like me, are as susceptible to this problem as anyone else, which is why I seek the advise of my interior designer mother-in-law, Pamela Horton of Cotswolds Inns and Hotels, when it comes to my home, lest I ruin everything by knocking the whole place down and building a glass cube. If you need evidence of the dangers, watch The World’s Most Extraordinary Homes, and see what the brilliant designer of the ‘Walkie-Talkie’ has built for himself. 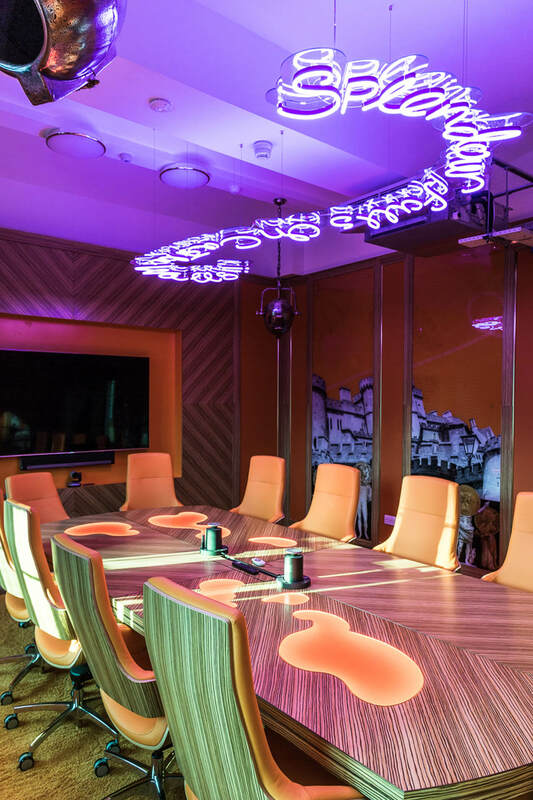 Unsurprisingly, it looks just like a sleek office, which is surely the worst possible look anyone can come home to, and is probably why it looks like no one actually lives there. Secondly, bright bold colours have to be handled very delicately in an office. That bright red reception area might seem like a good idea at the time, but within a few weeks some employees have been known to consider slamming their heads down on a sharp pencil, lest they ever see red pantone 032 ever again. 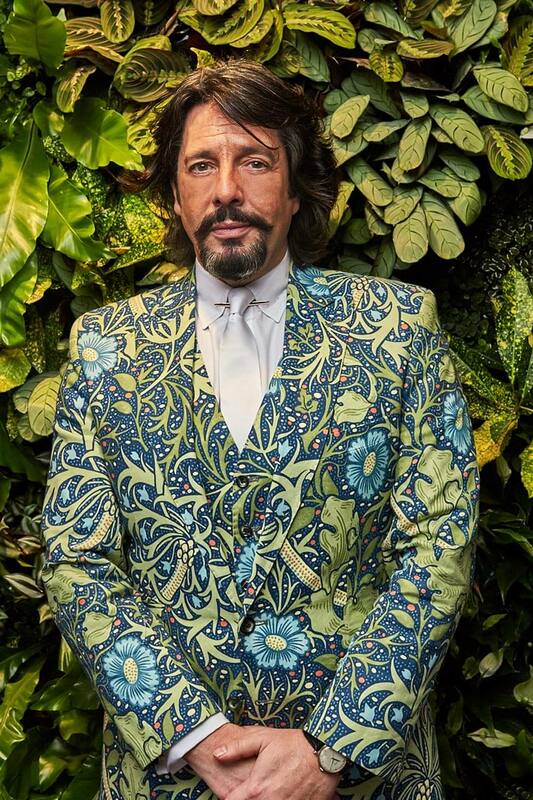 So it’s no surprise then, that I think appointing Laurence Llewelyn-Bowen, of “Changing Rooms” fame with a penchant for purple and orange, might prove to be a risk. If anyone has seen the gleaming glass headquarters of St. James’s Place from the car park of Waitrose in Cirencester then you might imagine that that is what Money.co.uk’s head office probably looks like. Peering through the glass it isn’t hard to imagine Laurence’s flamboyant style clashing comprehensively with this typical corporate office building. The front door is reassuringly frameless glass with a sharp company logo, as one might expect, but I can glimpse the trademark purple on the floor, a living wall and a Money.co.uk logo chandelier. 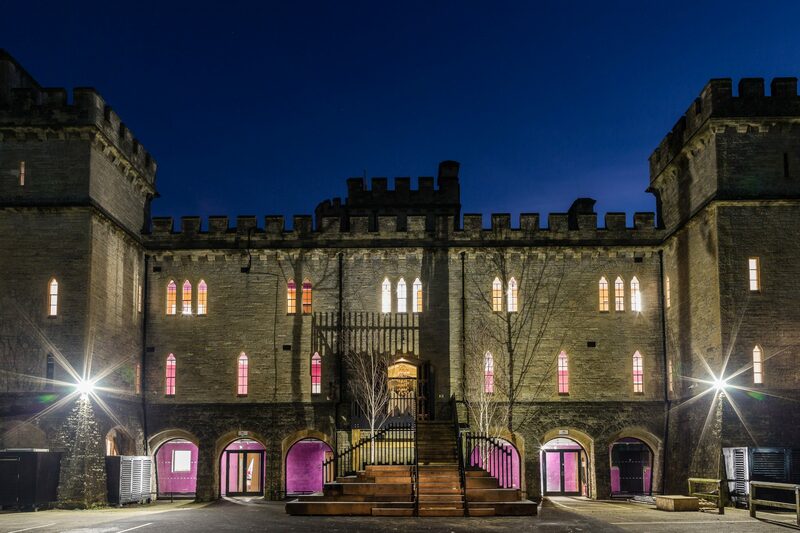 This is going to be interesting, perhaps even magical – there’s a hint of the Harry Potter about this building too. As you walk through the entrance to the reception area it’s clear that Laurence is going to relish the opportunity to jolt the workforce out of office mediocrity, not with random madness but with a clear strategy. “We spent so much time working on what this place felt like when you walked through the door,” says Laurence. “There you are, it’s a really crap Monday morning in January, you’ve got a little bit of a hangover perhaps, it’s raining outside and you’ve got to go to work. What is the first thing that happens to you as you step into the building? 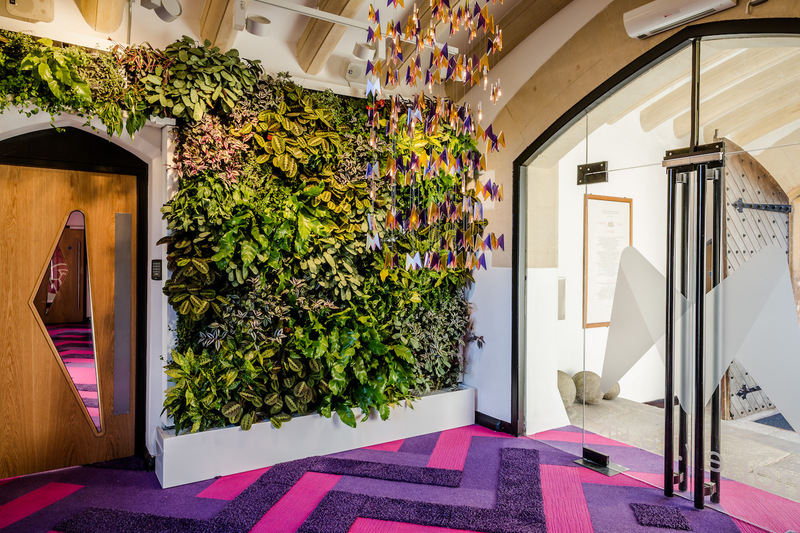 Here we’ve created an entirely living environment – we’ve got the vertical planting in the space, there’s bird song, there’s sense, there’s incredibly thoughtfully contrived lighting, to actually make you feel as you come through the door, ‘ah – this is an oasis’. We want the first point of contact for the people who work here to be unbelievably positive and something you actually look forward to,” Laurence informs me. And I see what he means. I’m not sure it will cure your hangover, but it will certainly distract you. 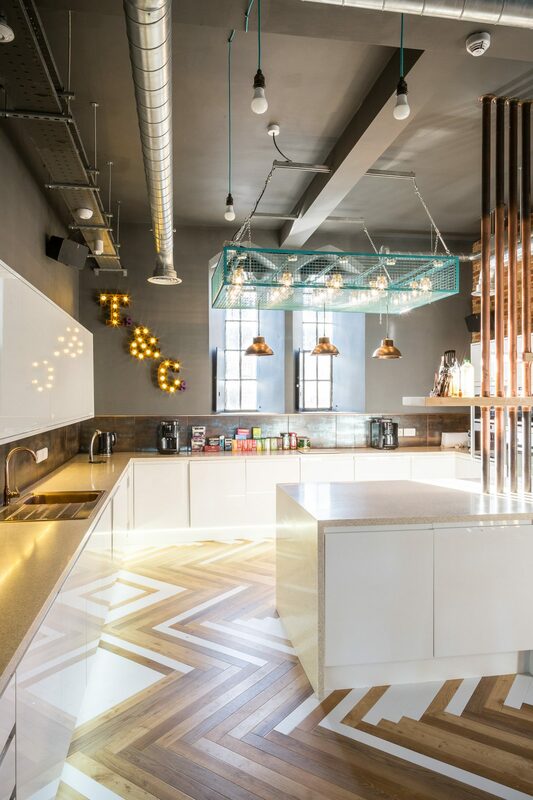 You can see a connection between the angles of the Money.co.uk logo repeated throughout the design the flooring is an infinite ‘M’ zigzag; even the office doors have custom made triangular vision panels to match. Are those birds on the chandelier? No, it’s the logo again; this is an office after all. The recurrent Money.co.uk ‘M’ zigzags through the floor pattern, but I’m starting to see ‘W’s for Wow! And the herringbone also has its finger right on trend. All this fashionable indulgence works well, still managing to stay on course as ‘relevant to the company’ and it had to be purple of course, just in case anyone is any doubt who the designer might be. I do wonder how this would sit in a traditional office building, but in a castle it absolutely works. Who wouldn’t be proud to work here? I’m going to say it straight out, before I take you deeper inside the rabbit hole – this office is a triumph. Yes, there are some areas that don’t work so well for me, but then some people don’t like marmite, and for them there is also plenty of jam, peanut putter, and marmalade in this office. 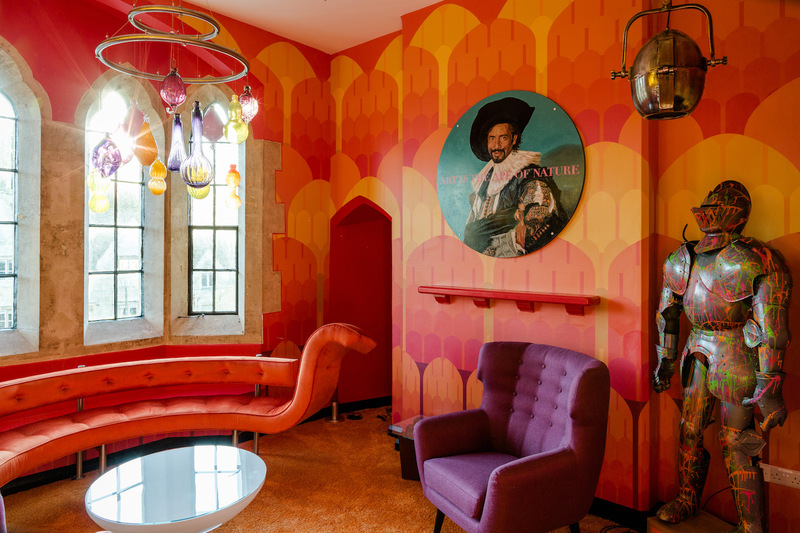 When I see the subtlety and detail that has gone into some of these rooms, I realise I must have underestimated Laurence Lewellyn-Bowyn; those flamboyant five minute makeovers concealed some serious talent. It’s hard to believe this is his first office. 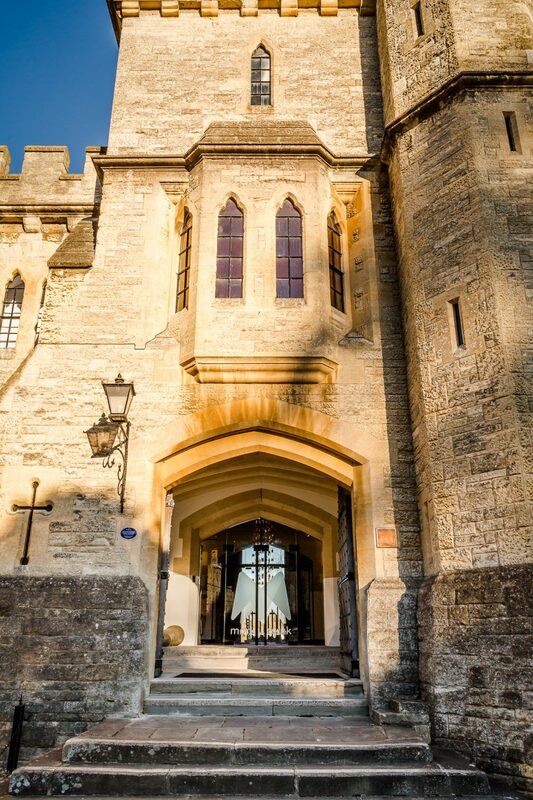 This stands as one of the best offices in the UK; not even Google have a castle. And it makes business sense too. If this office were in London, CEO Chris Morling tells me, it would cost four to five times more in property costs, and in a matter of years that adds up to millions. Chris clearly feels that that his money is better spent on his employees’ welfare. Additionally, the employees don’t have the painful daily commute in and out of the big smoke either. The passion for the Cotswolds is clearly shared by Chris who moved to the area 12 years ago, “I made the decision then that I wanted to build a business here, not least because I wanted a short commute and to enjoy the countryside, but also from a business perspective it makes sense – working in London is just so much more expensive.” You have to admit they have a point. 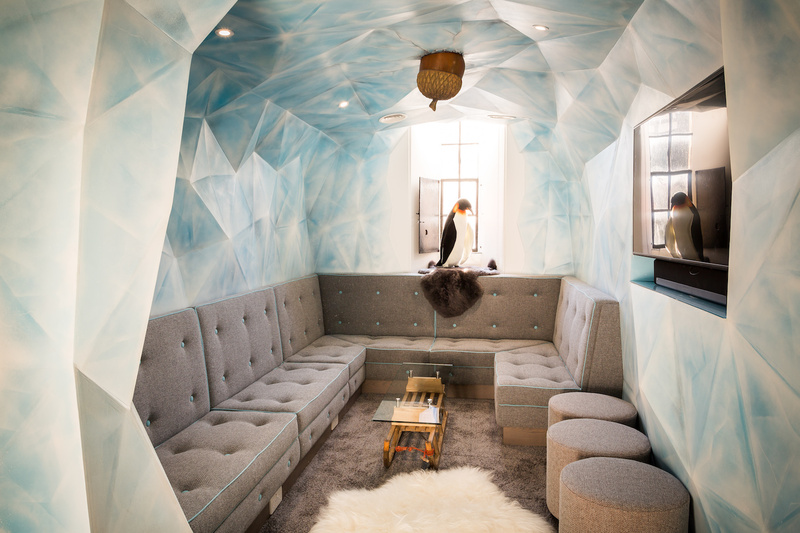 But less about the economics and back to the office: let’s start with the Ice Cave meeting room. What before was a damp, dark back room, probably only good for storing junk, has been transformed into a cosy quiet room that looks supremely practical for private impromptu meetings and quiet working. 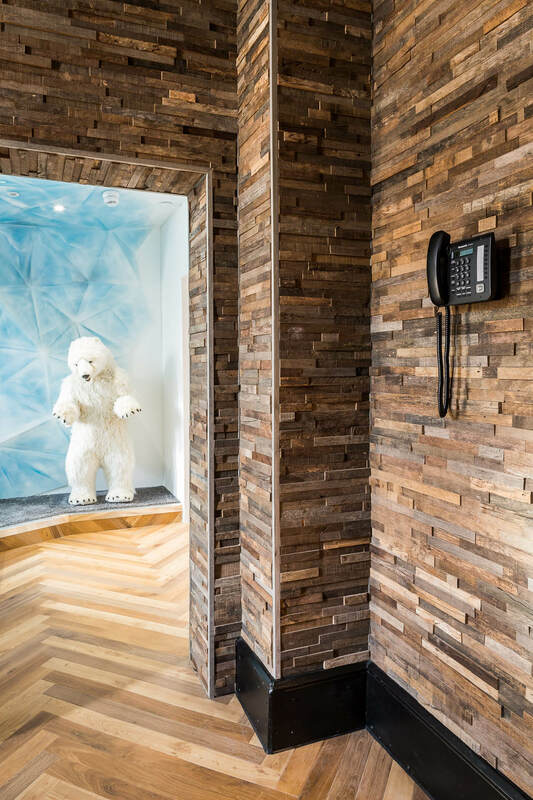 And it looks cool too (pun intended); the sled table is inspired, and the penguin on a fur rug is just the right side of amusing and pleasantly decorative. The subtle grey and blue colours work extremely well together and are calming, not shouting to distract you from your work. The angular walls add interest and there is an acorn stuck in the roof! Yes, we’ve seen similar in Google somewhere with their unlimited budget but this works just as well. Oh and nothing to see here, just a polar bear…! I hear what he is saying but then I’m confused by the subtlety of the kitchen, which is my favourite room. The colours are subtle and neutral compared with the other areas; there’s nothing in here to jar or jolt, it’s a real refuge. The colours change just enough to show something is at work here, but never raise the noise above anything other than a great place to hang out. The sofa and stool fabrics pick up the colours on the side of the arcade machine, with the fabrics on the Connection chairs subtly changing to pick up details elsewhere around the room. None of this is necessary to create a good space but we’re being elevated to higher plane here. The fabric of the pool table is new, embedded with the Money.co.uk logo and in a colour that seamlessly blends with the scheme. 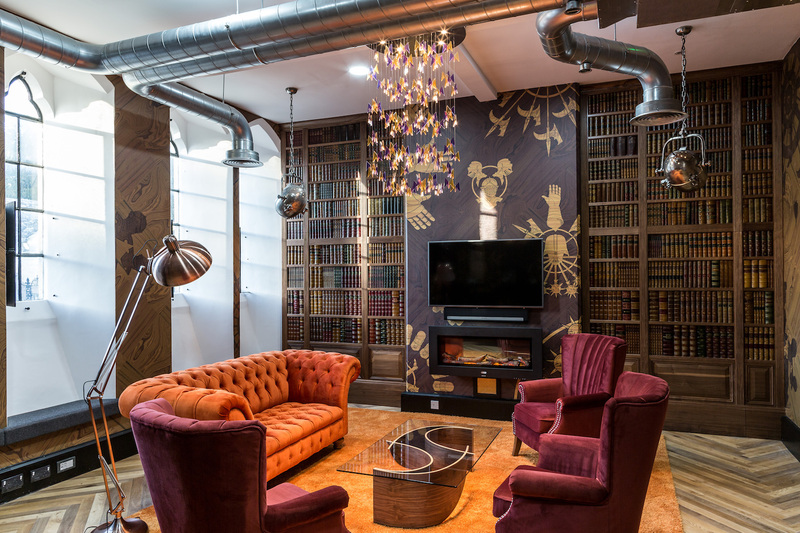 The copper pipes and industrial lights, along with the exposed ducting, tread just the right amount of industrial without veering too far into the clichés Laurence wants to avoid. 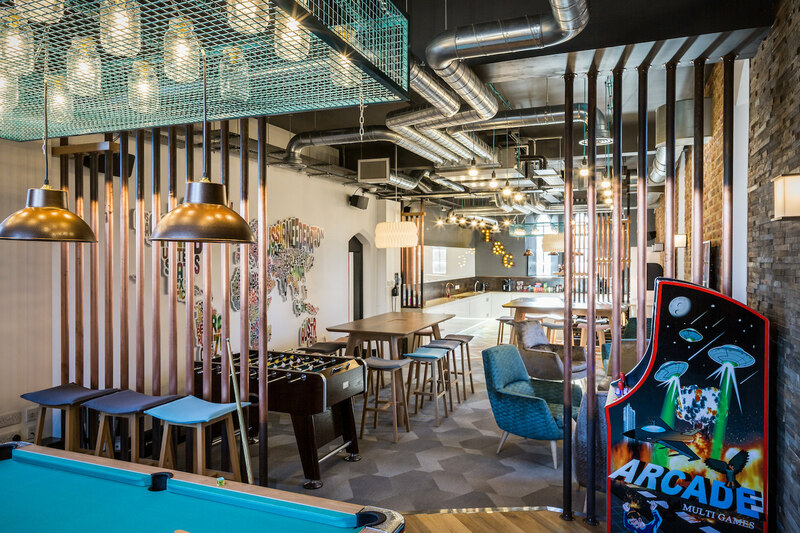 The detailing doesn’t stop there: the green accent colour on the cage light-fitting picks up on the custom colour of the wires on the hanging bulbs, and they match the death ray colour of the UFOs on the arcade machine; the exposed silver pipes; the copper pipe detailing; the copper effect splash-backs; the herringbone parquet flooring that echoes the carpet outside and bounces randomly between the white of the kitchen surfaces and the wood; the work-tops that flow down to the floor; the LED strips under the kitchen units lighting the floor. It really is very good. 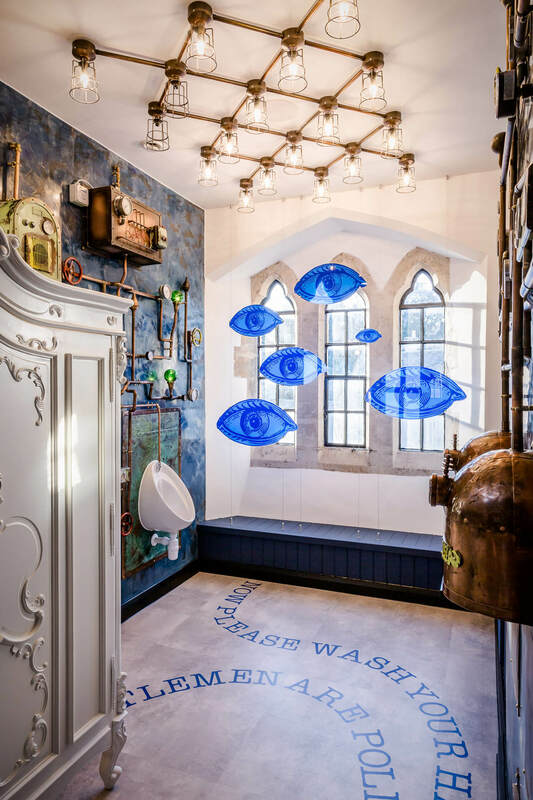 My admiration turns to astonishment in the loo, of all places; often the last place to get any love in an office. 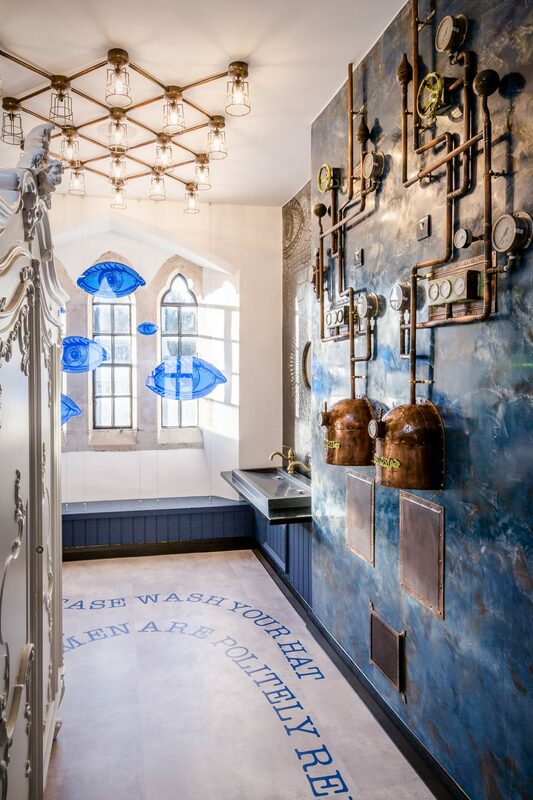 The hand dryers have been capped in copper and the whole wall has been elaborately decorated in a maze of copper piping, dials and knobs, turning the mere act of drying your hands into a magical ritual. Practically it’s completely unnecessary, and a waste of time and money in the real world, but it is uplifting to see the mundane so lovingly transformed. The colours sing with the attractive and thoughtful details, balanced in just the right measure. And the urinals? They get exactly the same treatment. My only surprise is that the urinals themselves are, shock horror, normal. Surely they should have been a monkey holding an ice bucket or some other wonder? It only serves as a reminder that our standard expectations have now shifted considerably up the bell curve. 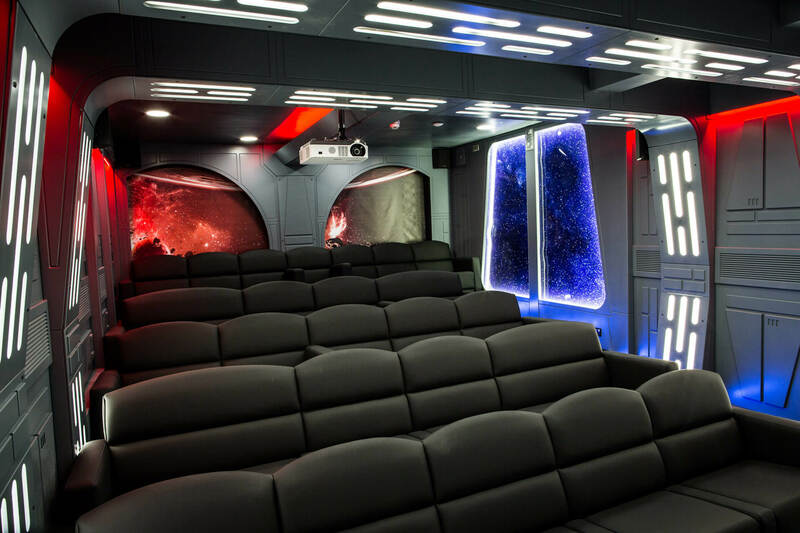 And there is more: a cinema room; but not like a smaller version of your local Odeon, this is a life-sized starship complete with views of distant galaxies through the ‘windows’ in 3D. Possibly some floor to ceiling digital wallpaper of ‘The Enterprise’ would ordinarily have produced a similar look, but that’s not good enough here, instead we have a fully realised film set. There’s one room that is pure ‘Laurence of my preconceptions’. I imagine that Laurence couldn’t contain himself anymore, and the Pow Wow room staggers from a full frontal hit of LLB. 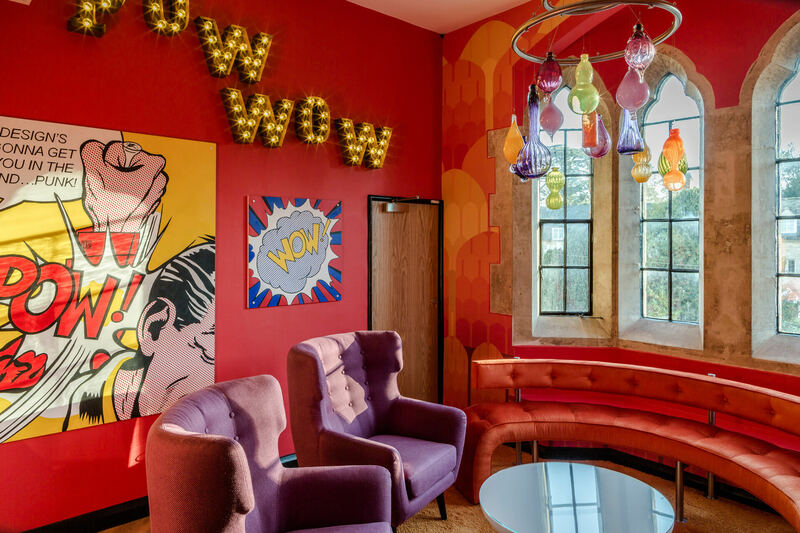 On one wall is a portrait of the man himself – the ‘Laughing Cavalier’ by Franz Hals has been remodelled with the face of the designer, emblazoned with the slogan ‘Art is the Ape of Nature’. 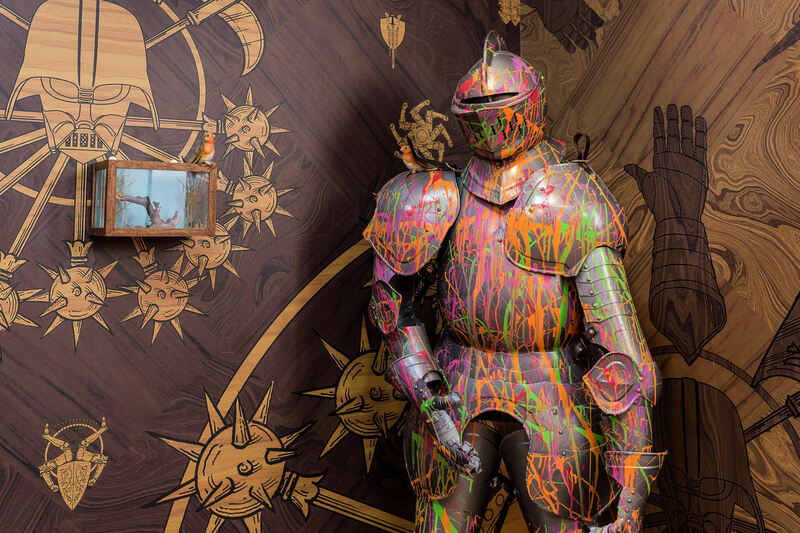 A traditional suit of armour fills the corner, paying homage to the history of the building, but it has been splattered Jackson Pollock style, with multi-coloured fluorescent paint. From his vantage point on the wall it’s as if Laurence has ejaculated on our medieval sensibilities; I have to stop myself from cheering him on! That’s an interesting way of putting it. Laurence can’t diss the style of Jamie’s Italian and Google in one breath, then wave through that kitchen and igloo, which I love. But, in my opinion, that only goes to prove that Laurence, Chris and the money.co.uk project team, are operating at another level altogether here. This is after all a working office and it never loses site of that fact. There is just the right amount of flamboyance “balanced”, as Chris Morling put it, so that every indulgence in fact serves an ultimate practical purpose. This office is so astonishingly good, that I can report that this is the most successful cross-fertilisation I have seen. We should never have doubted that Laurence, put out to stud in The Cotswolds, would produce anything other than a thoroughbred winner.